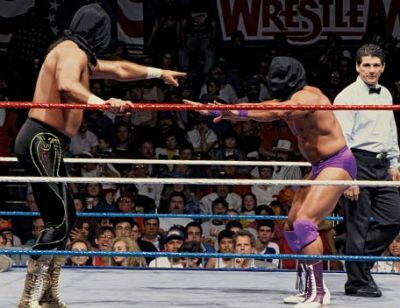 Wrestlemania 7 came at a time when our country was engaged in a battle with Iraq in 1991. The evil, Iraqi sympathizer and former U.S. patriot Sgt. Slaughter had won the world title and was defending it again the Real American Hulk Hogan. Of course the Hulkster won the battle and the belt, but the big story of the night happened on the undercard. Then WWF President Jack Tunney signed the two rivals to a retirement match at Mania 7, with the loser being forced to give up in ring action. The battle between the Savage and Warrior was epic, with the Warrior scoring the deciding fall in front of thousands of screaming and cheering fans. After he left the ring, Sherri entered and kick the Macho King while he was down. She was upset over the loss as Savage had been the only wrestler she worked with at the time. As she continued her rage against Savage, Elizabeth, who was sitting in the crowd, hopped the rail and charged the ring. The two women had a brief scuffle as Liz sent the Queen scurrying from the area. What followed was the biggest reunion in the history of wrestling (at least in my opinion) Savage and Elizabeth embraced and replicated the iconic pose with Liz sitting on Macho Man's shoulder like they'd done three years earlier. Savage and Liz had already been married throughout the angle of them being apart. But the reunion lead to a marriage on live TV at SummerSlam 91 and eventually Savage got back into the ring and won the world title again (more on that tomorrow). Other tidbits from Wrestlemania 7, the event was supposed to be held at the Los Angeles Memorial Coliseum, but was moved to a smaller venue. The company claims it was due to threats made against Slaughter and they didn't want to take any chances with it being in an outdoor stadium. I've read rumblings that it was because of sagging ticket sales. Personally, I think had they made a Hogan-Warrior II, they would have filled the coliseum with no problem. The event also featured 14 matches, which was becoming the norm back then. Jake "the Snake" Roberts beat "The Model" Rick Martel in what I believe was the company's first Blind Fold match. The Hart Foundation dropped the tag team titles to the Nasty Boys, and the Big Bossman nearly won the Intercontinental title after beating Mr. Perfect by disqualification. Andre the Giant (who was a face again) made his last Wrestlemania appearance at 7, by being in the corner of Bossman. This Mania also marked the only one for one of my all time favorites, Kerry Von Erich. The Texas Tornado pinned Dino Bravo. Wrestlemania 7 will also be remembered as the birth place of "the Streak." The Undertaker made his Mania debut that night, pinning now WWE Hall of Famer "Superfly" Jimmy Snuka. It's still hard to believe that was more than 20 years ago. So lots of significant events came out of that event that would impact the business in the weeks, months, and in one case decades ahead.